Kashmir is like a very beautiful but a wounded woman. For a long stretch of its history it has been coveted and ruled by many foreigners. Immense misery has been wrought on its inhabitants by the usurpers. Even today its neighbor, Pakistan, believes that it has the right to own it. Kashmir Problem has aged enough over its sixty years, without permitting a clear view to many of its observers of its solution, thereby maturing to have become an enigma. About a hundred thousand Kashmiris have died, many more wounded, and a lot more displaced from their homes in the wake of the war, terrorism, and hatred Kashmir Problem has engendered. 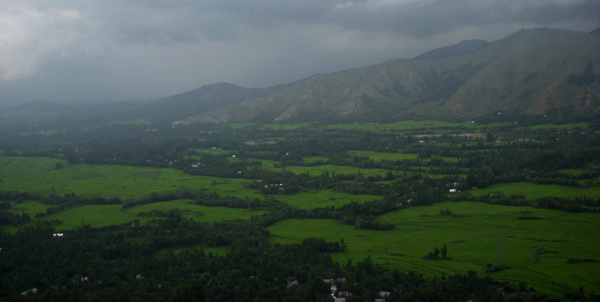 Above these images of Kashmir lie dark clouds of ignorance on the genesis of the Problem. Pakistanis and many people in the West believe that India is illegally occupying Kashmir. Why is the problem so intractable? Only because of Pakistans obstinacy to accept the facts. The facts are that in 1947, the year both India and Pakistan became free from Britain, Indian princely states had to make a choice of either being with India or Pakistan (a new nation being created). The choice had to be made by the ruling king of the state and its people had no say in the matter. There were about 560 kings involved. Because Maharaja Hari Singh of Jammu And Kashmir was known to be an arrogant and a difficult person to deal with, the Indian leader, Sardar Patel, and the Govt. Of Indias administrative executive, V.P.Menon, who were in-charge of managing the eligible states through the process of integrating with India, decided not to woo him to the India fold. A special legal document called Instrument Of Accession was created for the purpose of states integration with both India and Pakistan. The initial vacillation of Maharaja Hari Singh melted fast after the Pakistan army backed civilians attacked Kashmir, exposing the thinness of Maharajas military strength. He approached the Viceroy Of India for help, who in turn asked Prime Minister Jawahar Lal Nehru to intervene. Indian Government approached Maharaja Hari Singh telling him that that they would help him if he signed the Instrument Of Accession. Maharaja accepted the condition, creating the bedrock of Jammu And Kashmirs accession to India. It is as legal as anything can be. Meanwhile, India went to U.N. complaining about Pakistans unlawful incursion into Kashmir. U.N. declared a ceasefire which both India and Pakistan accepted. In the later negotiations in U.N. a move to hold plebiscite in Kashmir was passed but with the condition that the area of Kashmir presently under Pakistan (about one-third of Kashmir) should be first vacated and the people who originally lived there and had fled due to the Pakistan backed invasion should be brought back to participate in the plebiscite. (We do not know how U.N. will handle this matter as sixty years have passed since the people fled the area) Pakistan does not talk at all about this condition of the U.N. plebiscite. Many young Pakistanis know nothing about it. Also, this is a condition Pakistan is supposed to have been reluctant to meet as it does not have the confidence that the relocated people will favor them in the plebiscite. . Subsequent to the above indicated event Maharaja left his state and he was toppled in power by Sheikh Mohammad Abdullah, a leader of the peasants and the common people, who had been fighting the Dogra royalty over several decades. He has been the greatest Muslim leader Kashmir has had. This was a single instance during the transfer of power from Britain to India that in one state indirectly a democracy replaced a monarchy. The new Jammu and Kashmir Assembly twice voted to have the state be a part of India. So, the integration of Jammu And Kashmir state was made legal three times. Subsequently, in the next two decades, the Muslims became the leaders in government, commerce, and culture. They had never seen such prosperity in their history. But Indias neighbor, Pakistan, was not only not happy with Kashmirs prosperity but also had deep designs of its own about it. Pakistan is a benighted country, where except for the first few administrations after its independence the government has been run by its military. Constitutions, supreme courts, and parliaments have been changed to suit a new president. One of the glimmering gems it has been dangling in front of its very angry and disenchanted people has been Kashmir. Politicians have been telling the people that the jihad with India over Kashmir was ongoing and sooner or latter they would be bringing Kashmir to them. Wars in 1965 and 1989 were the offshoots of this thinking. Kashmir is a well developed intelligence base of Pakistan. Pakistan has spend over half billion dollars over years to seize Kashmir. But this has not happened because of the superior military power of India. The most important question about Kashmir is who does it belong to? The myth perpetuated by Pakistan is that it belongs to it by virtue of the Muslim majority of the vale of Kashmir, which is only a small part of the state of Jammu And Kashmir.No country can decide the nationality of a state of a sovereign nation. As has been indicated at the outset of this article that it absolutely belongs to India by virtue of the legality of the Instrument Of Accession which Maharaja Hari Singh of Jammu And Kashmir signed in 1947. It was followed by the state government run by the peoples leader, Sheikh Mohammad Abdullah. Historically unprecedented prosperity befell Muslims subsequently. If India is sending military forces and otherwise spending a huge amount of money on Kashmir, it is because it is trying to defend one of its states. The matter is the graver as the people who are disturbing Kashmir are from the neighboring country who are bent on annexing it. It is an international crisis. Which Western country would sit silently and see one of its states annexed. Almost all the Western countries would be very aggressive in defending their territorial integrity. The Eastern ethos mold of India has rendered it into a passive country. If it had defended Kashmir aggressively earlier then perhaps it would not have seen Pakistans war on Kashmir in 1989. The recent eruption of turmoil over Jammu And Kashmir governments transference of some 90 acres of land to a Hindu organization called Shri Amarnath Sangarsh Samiti for annually facilitating thousands of Hindu pilgrims journey to the Amarnath cave, a high level religious event. This was done because the government thought the organization would do a better job in constructing temporary shelters and other facilities for the pilgrims than it has been doing for a long time. The Muslim politicians seized upon this land transfer as a dilution of demographics between the Hindus and the Muslims and launched a bloody protest, which took the shape of the stoppage of work, food, and other amenities of living. In retaliation Hindus virtually stopped everything in the Hindu city of Jammu over two months, bringing the life there to virtually a standstill. The transferred land lies at 13,000 Ft. and so no one can live on it for an extended period of time. So, where does the demographic dilution lie? The Muslim agitation went beyond the land transfer to the breakup with India and joining up with Pakistan. Pakistan invests millions of dollars every year to keep the pot of unrest boiling in Kashmir. It also sends trained and armed infiltrators to achieve its goals. India has been rather weak taking the regular attacks inside its land in a low key, response as needed basis. Unfortunately, there is a lot of ignorance in the world about Kashmir. The facts are that Kashmir is a legitimate part of India and it keeps military forces there to keep Pakistani infiltrators and Pakistani backed insurgents in check. India is doing a legitimate thing in defending its land.